I love beauty boxes for discovering new products, especially as they're often great value for money! 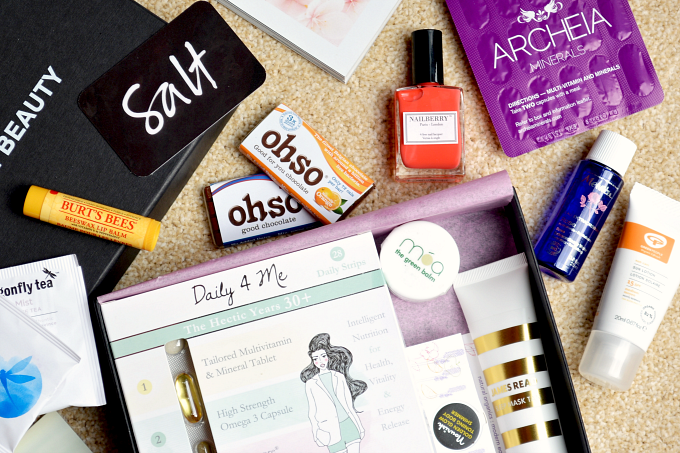 Latest in Beauty are one of my favourite beauty box services as they only release limited edition themed boxes rather than monthly subscriptions. 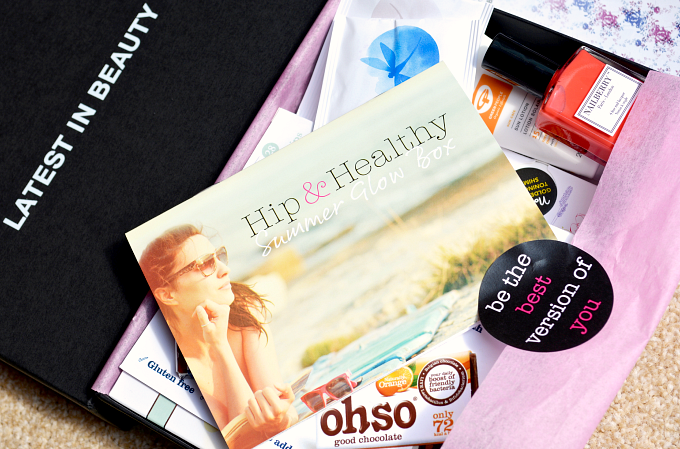 One of their latest releases is in collaboration with Hip & Healthy magazine for the Summer Glow Box*. The box is filled to the brim with selection of health and beauty products, all aimed to help with that summer glow! One of the first things that caught my attention is the gorgeous Nailberry nail polish in a warm coral shade called Groseille. If you're a regular reader I'm sure you'll know I love my nail polish so I can't wait to try out this new-to-me 4-free brand! There's a plenty of other beauty products too in handy mini sizes, including the wonderfully natural Moa The Green Balm, Melvita Rose Extraordinary Water, Green People Sun Lotion, Nourish Body Shimmer and a Burt's Bees Lip Balm. The only product I probably won't be trying out is the James Read Sleep Mask Tan as it contains a quite a few synthetics, but I'll pass it on to my sister as I think she would love it! To help you get the glow from the inside, there's also 4 week supply of Inner Me supplements targeted for women 30+ (I'm still a fair few years away from 30 so I will be passing these on too!) and a week's supply of Archeia Minerals for Hair Skin & Nails. To round off the box, theres a couple of sachets of Dragonfly Tea, Ohso Good For You chocolate bars (these didn't hang around for long!) and a £20 voucher for Salt Resort Wear - a luxury designer beachwear store. The contents of this box are worth over £100 in total, which is incredible value for money considering the box is available for only £16.95. To make it an even better deal, Latest in Beauty are offering free P&P for my readers using the code NATULIB14 - perfect if you fancy a little mid-month treat, but remember these boxes are limited edition so be sure to get in there before they sell out! What do you think of this beauty box? Are you tempted to pick one up? !